Did you hear this yesterday on All Things Considered? 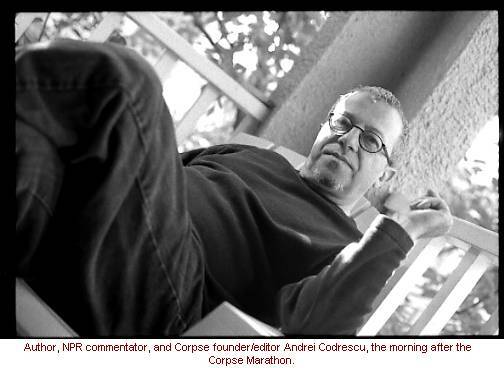 It's a short radio essay by Andrei Codrescu [realplayer] about his recent visit to Israel for a poetry conference. I said essay, but really it's an amazing prose poem that speaks volumes about the historical importance, the beauty and the wonder of the Jewish homeland and the tragic brutality of its occupation of the Palestinian homeland—all in 3 minutes and 28 seconds. If you're like me, a loving supporter of Israel's existence and deeply opposed to the occupation, you know that there is precious little public space alloted for the sort of understanding that Codrescu packs into his marvelous images. Did You Know Alison Bechdel Has A Blog? That's right , Alison Bechdel, the brilliant cartoonist of Dykes To Watch Out For. I'm not up on the whole web comics and print comics scene (though Ruth is big time... hmm maybe I can get a guest post out of her on web comics, since I'm mentioning them... no pressure Ruth)—but I love DTWOF. The only reason I found out about the blog is because I was looking around at Professor B's blogroll and noticed it there. The Link Is Dead But It's Not Forgotten. This Is The Story of Alberto Rotten. When you're out of the blue and into the black . . . The idea keeps coming up that Alberto Gonzales is going to make for a kinder, gentler DOJ. Earlier today Lambert at Corrente posted on the latest example in this syrupy genre, but the crucial background link was dead. I asked for it in the comments; he fixed the link and was kind enough to let me know with an email. Gonzales sat at the apex of the storm that swirled within the Bush administration's legal ranks over the use of "coercive interrogation" practices and torture to extract information from detainees in Cuba, Afghanistan, and Iraq. One of the "torture memos," produced in this period by the Justice Department's Office of Legal Counsel for Gonzales, argued that the president had the extra-constitutional power to nullify both the Geneva Conventions and the federal war crimes statute when he deemed it necessary, based on his inherent authority as commander in chief of the armed forces. Another memo, produced by the Defense Department's lawyers, opined that an interrogator was "guilty of torture only if he act[ed] with the express purpose of inflicting severe pain or suffering on a person within his custody or physical control." Together, these legal policies and memoranda adopted by the Bush administration on Gonzales' watch for the war on terrorism had the effect of eviscerating the nation's institutional, moral, and legal constraints on the treatment and interrogation of prisoners. President Bush and Defense Secretary Donald Rumsfeld may not have personally ordered the abuses at Abu Ghraib, but on advice from lawyers like Gonzales, they adopted policies that set the conditions for those abuses and the worst scandal to affect the U.S. government since Watergate. Yet, despite the incredible damage done by this scandal to the nation's political and moral standing in the world, not to mention its prospects of winning hearts and minds in the Middle East, no one of any significance has yet answered for these policies. Indeed, it appears many of the lawyers responsible for Abu Ghraib have been rewarded—OLC chief Jay Bybee now sits as a judge on the 9th Circuit Court of Appeals; Pentagon General Counsel William Haynes II was nominated (but not confirmed) for a seat on the 4 th Circuit; and now Gonzales stands to be promoted, too. A close examination of the Gonzales memoranda suggests that Governor Bush frequently approved executions based on only the most cursory briefings on the issues in dispute. In fact, in these documents Gonzales repeatedly failed to apprise the governor of crucial issues in the cases at hand: ineffective counsel, conflict of interest, mitigating evidence, even actual evidence of innocence. On the basis of these memos, Gov. Bush allowed every single execution—save one—to go forward in his state. It's not clear whether Bush directed Gonzales to provide such superficial and conclusory legal research, or whether Gonzales did so of his own accord. Regardless, the point remains that the White House's new nominee to head the Justice Department turned in work that would have barely earned a passing grade in law school, let alone satisfy the requirements of a job in which life and death were at stake. Perhaps more important, these early memos from Texas revealed Gonzales' startling willingness to sacrifice rigorous legal analysis to achieve pre-ordained policy results at the drop of a Stetson. Finally, to our President, when I talk to people around the country I sometimes tell them that within the Hispanic community there is a shared hope for an opportunity to succeed. "Just give me a chance to prove myself" -- that is a common prayer for those in my community. Mr. President, thank you for that chance. With the consent of the Senate, God's help and the support of my family, I will do my best to fulfill the confidence and trust reflected in this nomination. In the days since the presidential election, the conventional wisdom has emerged that President Bush won re-election on the basis of values. And fittingly, he has pledged to govern on the basis of his mandate from the American people to implement those values. But the Gonzales appointment makes clear that the Bush administration prizes certain values—such as personal loyalty as the president's consigliere—over more democratic ones such as accountability and a commitment to the rule of law. Hey hey, my my . . .
A friend of a friend needs to go from the Pacific Northwest to Tulsa, Oklahoma because of a family crisis there. She has no contacts in Tulsa, outside of the person she's going there to help. It would be very helpful to her if she could learn about community resources in Tulsa—church groups, women's groups, social service agencies, justice groups. If you know Tulsa and can give me any information to pass on, please drop me a line. I was going through unread RSS feeds and found that Jim at Paleojudaica posted a link to the Washington Post obituary for Professor Samuel Iwry, who died on Saturday, May 8 at age 93. When I was doing my masters in the Writing Seminars at Johns Hopkins, back in 1993, I had to pass off on a language requirement. (This is also where I met Jonathan David Jackson, mentioned in this recent post). I'd decided that I had a better chance at breezing through a Hebrew exam than I did at doing well in French, so I was referred to Samuel Iwry as the professor who would examine me. At the time, I knew nothing about him. I did not realize he'd been such an important scholar or that he'd led such an interesting life. Samuel Iwry, 93, a scholar of the Dead Sea Scrolls whose life story could rival the plot of an international adventure novel, died of a stroke May 8 at Sinai Hospital in Baltimore. Mr. Iwry made his mark as a scholar when he was a graduate student studying under the renowned archaeologist William Foxwell Albright at Johns Hopkins. His Hebrew language skills helped identify and verify the importance of the Dead Sea Scrolls. His traditional Jewish education trained him well for the task. He was born in Bialystok, Poland, and graduated from Warsaw University's Higher Institute for Judaic Studies in 1937, with accolades for his facility with Hebrew. His surname means "Hebrew" in the language, and family history says Mr. Iwry was a direct descendant of the founder of the Hasidic movement, Rebbe Israel Baal Shem Tov, who died in 1760. When the Nazis invaded Poland in 1939, Mr. Iwry became a leader in the underground resistance and escaped to Lithuania. He narrowly survived the crossing of Russia to reach Kobe, Japan, in 1941. He then made his way to Shanghai. David Ben-Gurion, who later became Israel's first prime minister, appointed Mr. Iwry to serve as Far East representative for the Jewish Agency for Palestine. His job was to negotiate with the British authorities for the escape of thousands of Jewish families who lived in the Far East. After enabling thousands to emigrate to Palestine, Mr. Iwry was captured by the Japanese occupying forces, imprisoned in Shanghai and tortured. As more [Dead Sea] scrolls were discovered into the early 1950s, scholars kept a special phone line between Jerusalem and Baltimore, through London. As Israeli scholars reported what was on the scrolls, Mr. Iwry was on the phone with Albright, giving him "a kind of intimate involvement with the scrolls that people don't know about," McCarter said. Mr. Iwry wrote the first doctoral dissertation on the scrolls and was regarded throughout his life as the expert on them. He completed his doctorate degree in 1951 at Johns Hopkins. Mr. Iwry was a popular teacher and lecturer, especially in Israel, where he drew large crowds who wanted to hear him speak Hebrew "because he spoke it as it was intended to be spoken," McCarter said. "It was not only for what Sam said, but how he said it that was so beautiful. . . . Between college and graduate school, I lived in Eugene, Oregon from 1991-1993. I went back to Delmar, NY to live with my parents for the summer of 1993, before I went on to Baltimore for my year at Hopkins. Though I felt more confident in my Hebrew than in my French, I was still sure that I needed to brush up on Hebrew grammar basics. My mom set me up with tutoring from a professor at SUNY Albany, an Israeli linguist who also has a background in Biblical studies. Throughout the summer, I met with her once or twice a week. We'd decided I would take my exam in modern Hebrew, rather than Biblical Hebrew, so she put me through intense drills of basic Hebrew vocabulary, usage and construction rules for all of the Hebrew prepositions and pronouns, conjunctions, the definite article—and, of course, Hebrew verb paradigms (binyanim). My tutor wanted me to pass the exam, but it also sort of seemed she was concerned that my performance on the exam would reflect on her professionally. My parents were paying for one hour sessions, but my tutor would generally keep me for as long as she felt she could successfully hammer more Hebrew language into my brain. We would work through section after section of her own, unpublished Hebrew textbook. Every so often, unexpectedly, she would shout in Hebrew across the house to her son, S., a few years younger than I, would he take out the trash, did he remember to go to the bank, had he called his father, etc, etc. Frequently it wasn't until an hour and a half or even two hours later, that my eyes would finally glaze over and my tutor would be satisfied that my mind had reached it's point of maximum Hebrew saturation for that day. She then would give me a pile of blank verb paradigm charts for me to fill in for multiple examples of each kind of verb we'd worked on, along with pages of English sentences for me translate into Hebrew. All my Hebrew sentences were to include vocalization marks (vowels); though fluent speakers and readers don't usually need the marks and don't use them, they carry grammatical information, which my tutor wanted me to master. At the end of the summer, my tutor made a list of the areas we hadn't yet covered and gave me a pile of assignment sheets to take with me to Baltimore, which I was then to send back to her for her to correct and return to me. Anytime I ever had any question about Hebrew grammar, I could and should call her, she said. Things started up at Hopkins. We had our orientation. I was assigned my advisor, and we worked out my courses and filled out the registration forms. Then there was the wine and cheese welcoming of the new masters students—scheduled on Rosh Hashanah until I complained ("but we asked the Jewish faculty and they said it would be fine . . ."). Then it was time to go see Dr. Iwry. (At Johns Hopkins it is considered decorous to address the professors as Dr.—this after my undergrad years at Brandies where it was typical for undergraduates to address their professors by first name.) When I arrived at Dr. Iwry's office and asked him when we could schedule my Hebrew exam, he would not discuss a date with me. Instead he insisted I begin sitting in on one of the intermediate level undergraduate Hebrew courses. He also sent me off with a reader* of classic Hebrew stories and essays from the first half of the 20th century and said that when I felt I could handle the readings and answer the Hebrew study questions he would give me the exam. This was nearly eleven years ago, so I don't remember all the details so clearly now. But my visits to Dr. Iwry's office went on for a good portion of the semester. I'd show up and report on how I did with the readings he'd specified and then he'd give me something else to do. In between visits with Dr. Iwry, I'd occasionally call up my summer tutor with questions about my work from Dr. Iwry. Each time I called, her exasperation would intensify. How could this Iwry be questioning what she taught me?! But she would also discuss in detail with me any of my questions. And she had me send her some of my work in the mail so she could look it over. Finally after about two months of this, Dr. Iwry agreed to examine me. The exam consisted of reading passages and answering questions from the the same reader he had given me the first time we met. I asked Dr. Iwry if he wanted me to include the vocalization marks. He said that wasn't necessary. My tutor had been a stickler about the vocalization marks, so I decided to put them in anyway, just to show Dr. Iwry what I knew. After about a week, I went back in Dr. Iwry's office to find out the results of my exam. When I walked in, Dr. Iwry sternly told me to sit down. "Mr. Greenberg," he said, "you've passed the exam." After a weighty pause, he continued, "most students don't have Hebrew like yours. If you don't keep studying, you're in big trouble." I don't remember what was said next, but after another minute or two I was on my way and did not see Dr. Iwry again. To date, I have somewhat failed Dr. Iwry. I crammed hard for all those months before the exam but didn't have much cause to use my new skills during the intense year of graduate courses, writing workshops, and thesis writing (a manuscript of poems). Though I've made periodic attempts to brush up on what I learned for Dr. Iwry's exam, I've forgotten a lot of the fine points of Hebrew vocalization marks. Nowadays, when it comes to the Hebrew verb paradigms, I only remember the most basic forms—though I had been able to construct most of the exceptional forms. I tell this story about Dr. Iwry every so often, but it's only at this writing that I think I understand his behavior. As far as he was concerned Hebrew was not a subject that one treats expediently, as a means to satisfy a program requirement. He didn't want to give the exam until he had some confidence that I might approach the study of Hebrew for its own sake. If I am correct about Dr. Iwry's intentions, then I feel even worse than I used to about my lapses in Hebrew study. But I console myself with two thoughts. First, I assume I will return to more serious study of Hebrew. I still aspire to read serious Hebrew literature for pleasure. Second, I like to think there is at least one thing I am dong right now that would please Dr. Iwry. When I tutor boys and girls for their bar/bat-mitzvahs (my part-time job in the evenings), I very frequently teach them something arcane about Hebrew vocalization marks—the rules for distinguishing between a sheva nach and a sheva na. The sheva is a vocalization mark (it looks like a colon (:) underneath a letter) that sometimes gets pronounced as a semi-syllable, a quick "eh," and sometimes is silent (it's the difference between saying "yoshvei" and "yo'she'vei"). Most Hebrew readers and speakers, even fluent ones, simply do whatever sounds "right" to them, based on whatever conglomeration of regional pronunciation habits they have imbibed from others in their communities. For non-fluent readers, the sheva can be the key to understanding how to parse the syllables of a Hebrew word. I also figure that the kids I teach are too removed from the processes of acculturation that taught their parents and grandparents their habits of Hebrew pronunciation. For these reasons, I prefer to teach my students a rational system. The message is that they themselves can figure out the correct pronunciation, without having to guess and without having to wait for someone else to tell them how it's done. The result is pronunciation that is not entirely the practice of any community of speakers. But my approach satisfies my need and my students' that I be consistent in my instruction. When my next students celebrate their bar-mitzvahs and bat-mtizvahs, I hope Dr. Iwry will be listening and that these young people make him smile. *I've been racking my brains to remember the name of the book Dr. Iwry gave me to study. It was a hard cover reader, the readings, questions and front-matter all in Hebrew. My impression is that it was published several decades ago and is considered a classic book of its kind. Anyone out there have any idea what book I'm talking about? jerusalem wanderings is a new blog by, Leah, an American born Israeli woman. She's only been blogging since April, so if you go there now you can read all the posts pretty quickly and be on board for what looks like a great blog to follow. There are several reasons why I love reading jw. For one thing, if you follow events in Israel, even if you follow them closely, it's hard to get any sense of what life is like for people living there. Leah gives many wonderful details that capture bits of daily life in Jerusalem. Also, I like her politics. Outside of Israel, if you're on the left about Israeli-Palestinian issues and you love Israel, you can end up feeling quite embattled and lonely. Leah doesn't pontificate about politics. She reports on Israeli-Palestinian peace movement stuff, but mostly her politics are expressed in what she tells about her personal interactions and experiences. Leah's been living in Israel probably for 20 years or more. There's plenty personal and political that could make her cynical and bitter. But her love of life in Israel is intoxicating. Her love of Palestinians and their culture is also clear. She doesn't hesitate to call folks on their stupid racist assumptions about Palestinians. Let's, see what else . . . the writing is unpretentious and really good. Anyway, go read it . . . Correction: Heard from Leah herself, who told me she's been living in Israel 10 years, not 20. I guessed wrong based on the ages of her children. I assumed her children were all born in Israel, but that was not the case. Seems I was a day early on this one. See yesterday's post . . .
Of course once I started thinking I'd post something for Ronn's Poem On Your Blog Day, books started raining off the poetry shelves. But given the hour, I'm going to try to keep to just a poem or two. I have a favorite poem—among many favorite poems—which is not a truly great poem. Or maybe it is a great poem, but compared to other poems by the same author it's hard to call it great and be emphatic about it. The poem is by Frank O'Hara. of President Warren G. Harding and Horace S.
1. The whole poem takes place as the speaker's lover's eyes are opening from sleep. The lover's eyes are opening in the first two lines and they're still just opening in the last two lines. 2. What that "what," hanging off the end of the last line of the first stanza, does to the tone of the second the stanza. a) something about that gets the feeling of watching traffic from the my recently deceased (both at 99, 6 weeks apart), maternal grandparents' 13th floor window on the lower east side of Manhattan (the co-op apartments on Grand Street, between Essex and Clinton). When I was a small boy, I'd stand at the window, looking out over my grandmother's plants on the sill, and watch the cars and the pedestrians and the bigger kids playing basketball. b) the way "elephantine" comes associatively from the day's "soft grey way" the same way Horace S. Warren comes from Warren G. Harding and blonde Agnes come from the first blonde girl. The two packages of Camels in the speaker's pocket probably would not have come up except for the similar kind of associative thinking that gets him from elephants to camels. There is a beautiful emotion in this even as it seems to complain of being too cerebral. The subtle shifts in tone and diction are marvelous. O'Hara masters similar effects more perfectly in other poems. But if it's slightly clumsy here, it's also charming without exactly trying to be so. 6. "your breathing is like that history lesson"
This is a beautiful line. Such quiet, understated tragedy. The speaker is able to expand the millisecond of his lover's beautiful waking by allowing his distractable nature to have free reign. The speaker's mind flits from association to association, whether in word, image, or memory. He means to be enraptured by his lover's breathing but he's missing it the same way he missed whatever it was he should have learned about Warren G. Harding (whose name is so ugly, compared to the rest of the words in this poem). The second poem I want to include is by Muriel Rukeyser. By chance it has the same generic title as O'Hara's poem. I'm not going to comment on this one except to say it is a favorite of mine because of how it helped me to feel less alone in the aftermath of September 11. I lived in the first century or world wars. We would try to imagine them, try to find each other.